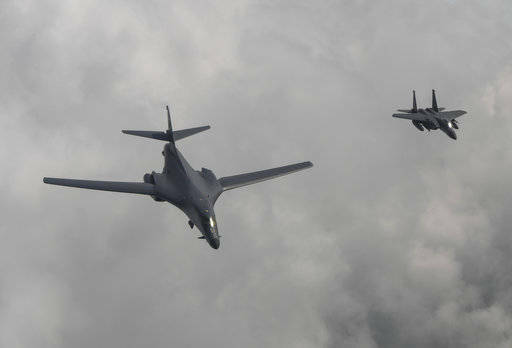 In this photo provided by South Korea Defense Ministry, a U.S. Air Force B-1B bomber, left, flies with a South Korean fighter jet F-15K on Sunday over the Korean Peninsula, South Korea. The United States flew two supersonic bombers over the Korean Peninsula on Sunday in a show of force against North Korea following the country’s latest intercontinental ballistic missile test. SEOUL, South Korea — The United States flew two supersonic bombers over the Korean Peninsula on Sunday in a show of force against North Korea following the country’s latest intercontinental ballistic missile test. The U.S. also said it conducted a successful test of a missile defense system located in Alaska. The U.S. Missile Defense Agency said a Terminal High Altitude Area Defense, or THAAD, system located in Kodiak, Alaska, was successfully tested on Saturday night, Alaska time. It said that a medium-range ballistic missile was air-launched over the Pacific, and that the THAAD system detected, tracked and intercepted the target.